The Nike Sportswear Windrunner Down-Fill Men's Hooded Jacket features a panelled hood for optimal coverage and lightweight down insulation for warmth. 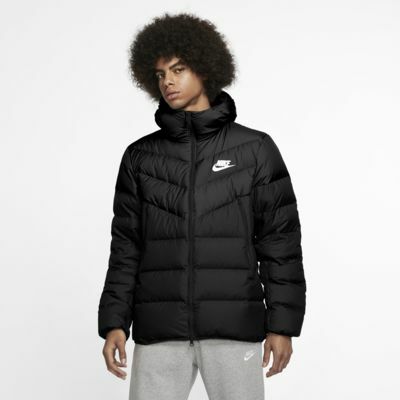 The Nike Sportswear Windrunner Down-Fill Men&apos;s Hooded Jacket features a panelled hood for optimal coverage and lightweight down insulation for warmth. Fabric: Dark colours: Body/lining/inset fill: 100% polyester. Fill: Minimum 75% grey duck down. Light colours: Body/lining/inset fill: 100% polyester. Fill: Minimum 75% white duck down. The jacket fits well and feels great. It's warm--I have worn it in 6 degree farenheight weather (with a sweatshirt underneath) and have been warm. But I am disappointed in the durability of this jacket. Every day, I see down filling coming out of the jacket. Before long, I'm sure it will look uneven and not be as warm. Nice jacket, keeps me warm during chilly winter weather here in Washington. Jacket is very well made. Could be a little slimmer, but nothing bothersome. I purchased the red color (on sale at my local Nike store) and hope to buy the blue in the future!